Bright Side of News has published a preview of their experiences with MSI's new Stealth case. The reviewer complains about the blatant misspellings on the product's packaging, and quickly noticed that the USB 3.0 ports on the front panels were misaligned. The third issue with the review sample was the most significant though, within a second of powering on the system, smoke started pouring out of the case! 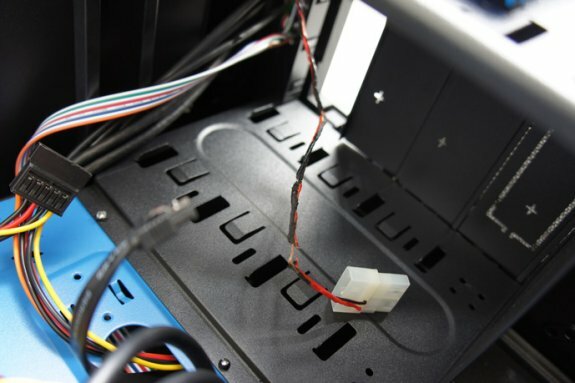 Upon closer inspection, it appears the Molex connector to the front panel had melted and scorched the top of the reviewer's DVD drive. Further details and photos at BSN. MSI believed that the combination of so many issues was due to damage during shipping. However, the USB 3.0 were firmly and permanently in their out of spec alignment, and the internals of the chassis were well protected, and did not appear damaged (other than the subsequent fire damage). The replacement which was supposedly a retail mass production unit still had the spelling errors on the packaging, misaligned USB 3.0 ports, but thankfully did not catch fire. Our full review is forthcoming, and will address more issues with the chassis, as well as the positives.